Chandeliers are often the focal point of dining rooms. Therefore, it is important that you not only choose one that fits with the room’s décor, but that is the proper size and shape with the right amount of lighting. In today’s houses, many rooms, including the dining room, have ceilings that exceed eight feet. This added dimension can cause some hesitation when beginning your chandelier search. With the following suggestions from Pittsburgh’s Executive Chandelier Services, you will be on your way to a stress free purchasing experience. Prior to beginning your search for the perfect chandelier, you must measure the size of your dining room, as well as the size of your dining room table. Both measurements will play an important role in selecting an appropriate centerpiece for your room. With measurements in hand, you are now ready to begin your search for the perfect dining room chandelier. The “one size fits all” scenario definitely does not apply when purchasing a chandelier. You must consider chandelier height, size, shape as well as the amount of lighting needed in comparison with the size of your dining area. Chandelier Height – A rule of thumb when considering chandelier height is for every foot of room height, the chandelier should be 2.5 to 3 inches high. Therefore, a dining room with 12 foot ceilings should have a chandelier height of approximately 30-36 inches. In addition to the chandelier height, you must consider the height at which you will hang your chandelier. The bottom of your chandelier should hang between 30-36 inches above the top of your dining room table. In some cases, you may have to adjust accordingly, so that the visual space matches the style of the chandelier. Also, you do not want to hang the fixture so low that the chandelier interferes with the sight line of people at the table or low enough for someone to bump their head. Chandelier Size – The size of chandeliers vary greatly, from traditionally large ornate pieces to small, sleek modern artworks of light. Choose a chandelier that is one-half to two-thirds the width of your dining room table or a foot less than the width of the table at its widest point. This general rule not only will help make your choice aesthetically pleasing, but will avoid the problem of someone hitting their head. Chandelier Shape – For dining rooms with higher ceilings, choosing a chandelier with an elongated shape typically works well because it takes up vertical visual space. Depending on the amount of ornateness you choose will also determine the amount of virtual visual space you have. Wider, rounder chandeliers are mostly found in dining rooms with lower, standard ceilings. Amount of Light – Often, people make the mistake of choosing a chandelier that will provide the primary source of light for their dining room. Chandeliers are meant to be a decorative centerpiece that creates a sense of style, as well as ambiance. Many homeowners choose wall dimmers for their chandeliers with additional lighting, such as wall sconces or cove lighting, to create a relaxing atmosphere. Also, it is recommended to avoid high wattage bulbs, as they increase heat and table glare. Executive Chandelier Services, LLC recommends always checking the retailer’s return policy when purchasing light fixtures. What may seem the perfect match in the store, may not feel right when you place it in your home. 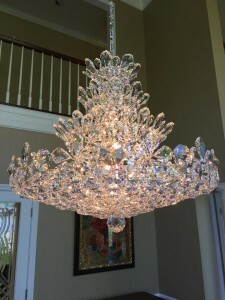 Executive Chandelier Services, LLC brings more than 20 years of experience in cleaning, installing and restoring all types of lighting in the Pittsburgh area. Reliable and highly skilled, no job is too big or small. If you want to ensure you are protecting your chandelier investment, schedule a professional service at least once a year. For a free estimate, call 412-487-9219. The quality of work is exceptional — and the results are extraordinary.